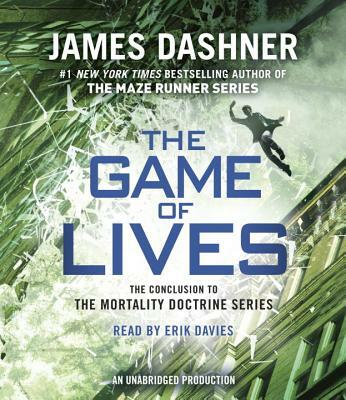 From James Dashner, author of the #1 New York Times bestselling Maze Runner series, comes The Game of Lives, the final book in the Mortality Doctrine series, an edge-of-your-seat cyber-adventure trilogy that includes The Eye of Minds and The Rule of Thoughts. And don't miss The Maze Runner movie and its sequel, Maze Runner:The Scorch Trials, from Twentieth Century Fox! James Dashner #1 New York Times bestselling author of the Maze Runner series: The Maze Runner, The Scorch Trials, The Death Cure, and The Kill Order, as well as the bestselling Mortality Doctrine series: The Eye of Minds, The Rule of Thoughts, and The Game of Lives. Dashner was born and raised in Georgia, but now lives and writes in the Rocky Mountains. To learn more about him and his books, visit jamesdashner.com, follow @jamesdashner on Twitter, and find dashnerjames on Instagram.